Please note that we have taken this article from our sister site, Fish-etc.com, for your convenience. Japanese say that a Koi keeper’s expertise is measured by the number of Koi that have perished in his care. If you wonder why, the answer is simple. They know that human beings learn a lot more from their errors than from perfect instructions. All I can offer are perfect instructions. In the light of the Japanese belief above, I am tempted to say: Use them, or lose them. Yet, I believe in people and ultimately believe that Koi lovers genuinely desire to do the best they can. Therefore, in the hope that you are ready to take instruction — and provided you have not installed a pond yet, I urge you to commit this article to memory before you go out to buy your equipment, or talk to a pond installer, or begin the construction yourself. If you have already put in your pond and it does not work, or you are still not sure if it has everything it is supposed to, you have my deepest sympathy. Read this article carefully. Do not cry over it, or rip it to shreds in anger. Read the introductory paragraph once more and keep what you learn here for referencing once you have regained your composure. Essentially, a Koi pond is a life support system, or outdoor aquarium, for the fancy carp known as Nishikigoi, which we usually call Koi. That is why this article has nothing to do with garden water features! With one single exception: If you are about to install a garden water feature, but have not yet done so, I urge you to think again. Before you state that you do not want a koi pond, stop for just a moment and ponder this: What if you change your mind and decide that you want to have Koi after you’ve put in your garden pond? By then, my friend, it will be too late. Because you can always use a Koi pond to grow water plants and create a tranquil environment, but more often than not, a water garden pond is an inadequate environment in which to keep and raise Koi. Understand that there are several inherent flaws with water gardens that make it impossible to transform them into Koi ponds. They are too shallow and have no bottom drain. They are usually constructed with little or no thought to water flow. They have several features that are sure-fire predator attractants, such as plant shelves that serve as creature perches for heron and other fish eating predators, and shallow areas that herons just love to wade in as they fish out your prized Koi, instead of frogs. Even if you’re absolutely certain you won’t ever have Koi, you are still better off building a pond that can serve as either a water garden pond or a Koi pond, because if you ever wanted to sell your house, the buyer might be swayed to the purchase simply because he or she has always wanted a Koi pond. Unfortunately, most people never stop to ask the most essential question until after they have already put in their Koi pond, or until they’ve paid someone a hefty sum to put one in for them. And when they finally ask the experts and get the expert answer, namely that the cheapest way to get what you need, is to start over, they usually lament the money they already spent. I cannot console you. But I can urge you to read the first paragraph of this article again. What are the essential components of a good Koi pond? What exactly do you need to have in a good Koi pond? Not much, really. There are five must-haves: a bottom drain, a surface skimmer, a pump, a filter, and an ultraviolet light. Although it’s possible to have a great pond without all of these, it is not an easy excercise. Actually, it is much harder to go without any one of these components, than it is to simply include them all. At the very least, build the pond so that the part you’re leaving out can be added later, when you really need it, for example, the ultraviolet light. The purpose of a bottom drain is to remove fish waste and other organic debris that accumulates on the bottom of the pond. Fish waste either floats (which can happen when the fish are not feeling well, or not digesting their feed properly) or it falls to the pond floor. The natural force of gravity, coupled with the turbulence caused by the koi swimming in the pond, cause fish faeces and other sinking debris to tumble toward the bottom drain. Muck on the pond floor is one of the most dangerous threats to the health of your Koi. It is here that many of the most common, and significant, bacteria and viruses will breed and grow. Would you want to go swimming in your toilet? Well, neither do your Koi. It’s best to have the pond floor slope slightly towards the bottom drain to facilitate the movement of bottom waste toward the drain. Bottom drains are available for both new installations as well as existing ponds that need a retrofit to include a drain. They are inexpensive and worth their weight in gold. The bottom drain also functions as an intake for the pump which will feed the filtration system. While a bottom drain removes materials from the bottom of the pond, the skimmer takes care of dust and other debris that collects on the pond surface. Dirt and dust particles adhere to the water surface, no matter where you live. As it builds up, it turns to muck. Add to this the grit and leaves that gather on the pond surface, and you have a pond scum that is prime territory for pathogens harmful to your fish’s health. A skimmer is a low profile, painless way to remove surface debris from the pond before it can become a problem. There are a number of water garden skimmers available on the market, some of which include filters as well; we prefer skimmers that are skimmers and filters that are filters. The no-niche skimmer is an excellent product that can be retrofitted to an existing pond that doesn’t already have a skimmer. We like to use swimming pool skimmers; they’re easy to install and service. Prices vary from model to model and from manufacturer to manufacturer. This essential piece of pond equipment powers both the skimmer and the filter. We recommend an external pump for a koi pond. The biggest reason is safety. All pumps fail eventually, no matter how well made they are. If yours is in the pond when it finally decides to quit working for good, it can do one of two things. If it’s an oil filled pump, it can spew oil all over your pond. Even if it is not an oil filled pump, it can release electricity into the pond. Either scenario is bad for your pond and potentially lethal for your fish. As we see it, your koi are worth more than your pump. They’re also irreplaceable, while your pump is easily replaced. It makes the most sense, then, to use a pump that has less potential for harming your koi. The second reason to use an external pump is convenience. A pump sitting outside the pond is easier to service, since you don’t have to don your scuba gear or swimming trunks to get to it. You can keep your hands and feet dry while inspecting, repairing, or checking an external pump. External pumps either come equipped with, or are adaptable to, primer pots and leaf baskets that catch small rocks and similar material that would normally clog a submersible pump. You will not believe me if I tell you how often frogs and water snakes land in these baskets! The pump you select needs to be sized to the job it is expected to perform. Boy, now there’s an understatement! Pump companies publish flow rates that are based on tests done in a laboratory, often without calculating the real-world pond setting that includes lifts, pipes, and elbows, filters etc, all of which will reduce your flow rate. The pump manufacturer might say that the pump gets 10,500 litres per hour. But what does that mean to you and me? It means that in a real pond situation, with a bottom drain, a skimmer, a lift of about three one metre to the water fall, several elbows, a run of tubing pipes, plus the resistance of a filter and an ultraviolet light, that same pump may only get 5200 litres per hour — and that is IF the entire arrangement is designed properly. In our never-ending quest to save money, many people in the koi pond industry have gravitated to low amperage pumps, but we are not among them. In order to move large quantities of water, a low amp pump can often only handle low pressure and lower head, which is the distance between the water surface and the height to which you are pumping the water. This kind of pump can’t feed a tall waterfall, or pump water efficiently through a tall bead filter. Pump manufacturers realize that consumers pay attention to amperage, and have been known to list the running amperage, rather than the start-up amperage. To me this is deception, whether legal or not! By making the pump appear to be lower amp, these manufacturers tell customers what they want to hear, but not what they need to know. Then also consider this: Your fish load should be estimated to take into account that in a healthy environment, your Koi will grow like crazy! You may start out with a dozen 15 cm Koi, so your initial bio load will be a little over half a kilogram of fish. But in three years, that load is likely to be close to 25 kilograms! Filters are like religion; everyone has one, and adherents are always convinced that theirs is the best until they find a different one. Forget about under-gravel filters that don’t work for a higher fish load. Forget about lava rock that is totally inadequate for Koi pond applications. Forget swimming pool filters that need changing the sand every week, just like diatomaceous earth filters. Forget trickle towers and bio balls, filter mat and vegetable filters. Because in truth, the perfect filter for a Koi pond just does not exist. But there are a few that will work well. We like multi-chamber filters for Koi ponds, based on the filter systems used by Japanese Koi breeders. These usually consist of one or more settling chambers and a number of media chambers. When properly designed and maintained, this system can provide consistently high quality water. Their only ripple is that they must be cleaned periodically. Unfortunately, no one’s yet invented the self-cleaning filter. In the last few years, we have also successfully used bead filters. When properly sized to the task, they have proven both effective and user-friendly. It’s been necessary to clean them more frequently than the chambers of the Japanese-style filter system, but this is less tiresome and odiferous, thanks to the use of a back wash valve. When used in conjunction with ultraviolet lights, both of these systems are very effective. Ultimately, trial and error will lead you to the precise system that’s best for you. The beauty of the ultraviolet (UV) light is that it will virtually eliminate the curse of pea-soup green water. You can put a filtering system in place to first see if it’s enough to keep the pond clear all year long. The next year, if you’re not satisfied, you can add a UV light if you want additional water clarity. Although they’re sometimes sold as “sterilizers”, they don’t really sterilize at the flow rates generally used for ponds. UV lights might sterilize when the water passes through one at the rate of 15 litres per minute, but in most pond applications, the water is racing past the light at 75 to 250 litres per minute. At this speed, the UV light does not sterilize. It doesn’t need to, anyway. Its primary purpose is to inhibit the growth of free-floating algae and prevent the dreaded pea soup green algae syndrome in the pond. It won’t be effective at sterilizing the water to prevent fish illness or disease. Even if it could, it only neutralizes pathogens that flow past the light, and can’t reach pathogens that remain in the pond, on the walls or the pond floor, or on the fish themselves. Besides these components, the Koi pond should be at least 1.5 m deep and have nearly vertical sides. The 1.5m depth doesn’t have anything to do with thermal layering and applies no matter where you live. Koi need a depth of at least 1.2m to get enough exercise. They need to swim up and down, not simply from side to side in the pond. What is more, large Koi like to feed in a perpendicular position, with their mouths sticking out of the water. They can’t do that in 1m of water. So you need a pond that’s at least two times deeper than the length of your largest Koi and for most Koi owners, that usually means a minimum depth of 1.5m. I have a client who converted her swimming pool to a gorgeous Koi pond once her children left home. I first thought the deep side at 1.9m perhaps too deep. But she painted the pool black and added an observation deck and her Koi not only display gorgeously, but are beautifully muscular and very healthy. The right water flow is critical in a Koi pond. You don’t want any dead spots where debris can build up and never be removed from the pond. A good rule of thumb is to have the water flow in at one end and out at the other. This may not prevent dead spots, but will cut down on them. You can use waterfalls or under-surface returns to bring water back to the pond. If you use a waterfall to create a return flow, make sure to install a bypass in case it leaks or when you need to turn it off. If you use an under-surface return, you may need supplemental aeration. Koi have high oxygen demands, especially when they are fed. Many Koi owners have air pumps, venturis, or air stones to supply extra oxygen. An aerated bottom drain is also very effective. It has an air bladder (a round disk with lots of holes in it). Air is pumped to the bladder, causing a circulatory effect where air is released at the bottom and raises in a column to the pond surface. 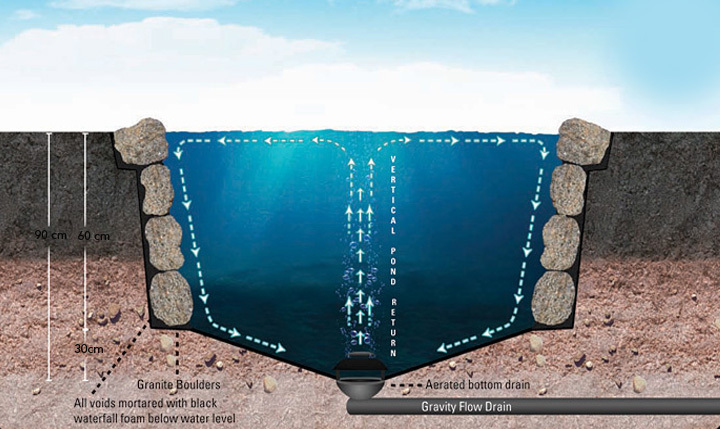 The water circulation causes debris to be sucked into the bottom drain. Make sure to put aeration devices on a separate switch so that they can be turned off when you want to see your Koi without the distraction of waves or bubbles. Always make sure to include a few stubbed-off ‘why in the world pipes’ through the pond wall. These are extra pipes that you may not need right away. Later on when you wish to make changes to your set-up you’ll ask yourself why in the world you did not put extra pipes in when you originally installed the pump. No matter how you do the math, Koi ponds are expensive. If you can’t afford one, then make a water garden for a few goldfish, and in a few years, upgrade to a full-scale Koi pond. Just do not compromise on the construction of a proper koi pond. In the long run, you’ll be glad you waited until you could afford the real thing! So will the Koi you intend to keep. It’s always a good idea to get help from an expert, someone who’s truly knowledgeable about Koi pond design and installation. Once you find that source, stick with them from beginning to end. Make very sure your “expert” knows about Koi ponds, not just landscaping or water garden construction in general. Make very sure your expert has a reliable reputation. Make doubly sure! Don’t burn your fingers. Many Koi owners have! Ask to see examples of what they’ve already done so you can be assured that they know what they’re talking about — and actually speak to the owners of those ponds. Koi keeping is very popular at the moment, and that kind of fame inevitably attracts those who talk a good show but cannot deliver. They can be found everywhere! The old saying “buyer beware” is just as true today as it ever was.